From Our Hearts: I’m not sure I can express how much we love Melissa. She does amazing work and is one of the kindest people you will ever meet. 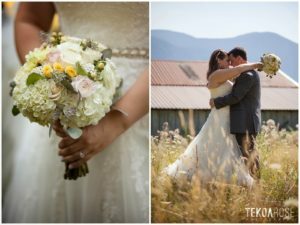 Trapp Desgins is our onsite florist because of her professionalism and incredible talent. and the ins and outs of the business from my family and continue to share the love of flowers with all my clients. 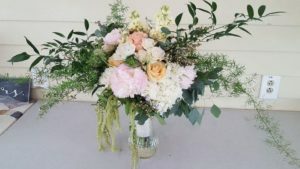 Piece of Advice: I love providing flowers that set your event apart and give it life. Flowers create a tone/mood that enhances the overall ambiance of the event. Don’t be afraid to go bold or try something different! Your overall design is an extension of your personality. wonderful people who work there. The value of the venue is how comfortable you feel and how welcomed all your guests will also feel. This feeling is what makes The Water Oasis my favorite venue. 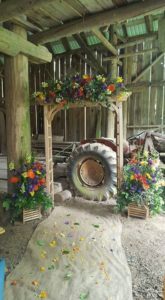 up/delivery/take down and a 10% discount off Floral Swags/Designs for the Arbor/Ceremony site!